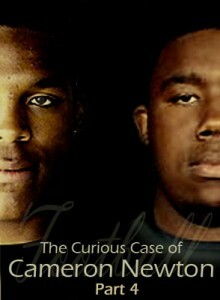 July 14, 2011 — Today in Part IV of The Curious Case of Cameron Newton, we examine how the Newton controversy helped fuel additional unsubstantiated assaults intended to damage the reputation of individual players as well as Auburn as a whole. Among the illusions often repeated was the contention that defensive end Nick Fairley, a first round pick of the Detroit Lions, was a ‘dirty’ player and that the Auburn football program is an NCAA scofflaw. Was Nick Fairley a dirty player? Chris Dufresne of the LA Times seemed to think so, even if his research methods were somewhat suspect. For the record, a search engine request using Dufresne’s name produced not one link to ‘ journalist’ or’ integrity.’” Draw your own conclusions. Dufresne’s exhaustive research aside, what’s the dirt on Fairley’s play? In the 2010 season the eventual Lombardi winner racked up a total of three personal fouls in fourteen games. One of those three was definitely deserved. The frustration-borne helmet shot on Georgia quarterback Aaron Murray warranted a flag. One was absurd and undeserved. Flagging Fairley for his brief celebration of a third down sack of Alabama quarterback Greg McElroy was ridiculous. If that was the standard, officials should have thrown several dozen flags on both teams during that game. Add in a roughing the passer call, always a judgement ruling, and you’ve got the sum total of Fairley’s sins. The subject of whining and crying from opposing fans when he delivered legitimate hits on their quarterbacks? Yes. But dirty? Not so much. Who needs facts, when perception is more compelling? Perception became reality. The facts didn’t matter. Why bother to check out the reality when the tabloid fantasy will draw more attention? Is Auburn a rogue program? While Fairley was unfairly tagged for dirty play, Auburn itself was labeled a “dirty” program. Andrea Kremer of HBO RealSports polished this well-worn apple when she vainly attempted to justify her program’s recent attack on Auburn athletics. Has Auburn had issues with the NCAA over the years? Clearly. But not recently, and that is a critical distinction. You have to dig back to a time when Madonna played a baseball player to find the last time Auburn had any major NCAA issues. Kremer rattled off the name Eric Ramsey and painted with the broad brush of “a history of NCAA violations” in an interview aired on the Paul Finebaum radio show where she discussed allegations made by four former Auburn players on an episode of her series HBO RealSports with Bryant Gumbel. Maybe Kremer just doesn’t want to admit to the mirror how much time has gone by, but Ramsey last played for Auburn in 1990. That’s 21 years ago. Since that time, through three head coaches, three undefeated seasons, seven SEC-West titles, two SEC championships and a national championship (or three, depending on who’s counting) Auburn hasn’t had a major infraction. Juniors and seniors currently enrolled at Auburn were not even born the last time the Tigers faced legitimate NCAA trouble. That concept hasn’t held an ounce of validity since Wilson Phillips and Bel Biv Devoe rocked the Walkman and Patrick Swazye starred in the hot new release Ghost. The allegations made by the four players who spoke to HBO — Stanley McClover, Troy Reddick, Chaz Ramsey and Raven Gray — were all vague and non-specific. HBO made no effort to verify the legitimacy of any of the claims, made no attempt to present an alternate view as espoused by hundreds of former Tiger players, and failed to disclose the gallingly transparent agendas of three of the four. Auburn will investigate the issue, as it should, and strive to find out the truth. Bear in mind that sour grapes have little value except to HBO and other muckraking jackals. Where does it all come from, this flood of negativity toward Auburn? The answers to that question are many. But is it really? Were Les Miles and LSU put under the same microscope during the Tigers 2007 championship run? Did Urban Meyer and Florida suffer a similar storm of negative publicity? One factor that contributes to the vitriol is the intense rivalry that exists between Auburn and its in state competition, Alabama. The two programs thrive and survive separated by less than 200 miles of highway, battling on the field, butting heads over recruits and fighting for hearts and minds. Since Auburn became the dominant program in the state 30 years ago, the rivalry took on a different flavor, one now dominated by message board hate and radio vitriol. The media plays a role as well. Auburn fans have come to expect and largely accept a slight, and perhaps even unintentional, slant from the state media, a topic worthy of examination in a series of its own. Another mitigating factor in the flurry of negativity toward Auburn is laziness on the part of many members of the mainstream media. Add to that the Internet-fueled need to be in front of a story and you have a toxic mix of sloth and speed that leads to today’s tabloid style of journalism. Some random blog makes an allegation and in fear of being trumped by the competition, larger media outlets grab the allegation and rush it to air. Even if they wanted to properly research a story they couldn’t because while they were verifying the facts, their competitors already had the allegation on the air. Being first has replaced being right. Take the New York Times story on an exchange between Auburn coach Gene Chizik and NCAA Vice President of Enforcement, Julie Roe Lach, that allegedly occurred during the SEC coaches meetings in May as an example. Thamel released the story on Wednesday night. It could be argued that his portrayal of the events offers a sensationalized version of the exchange. By Thursday morning the Times story reached critical mass. It appeared in USA Today, on ESPN, on FoxSports and thousands of other sites. None were new. Each merely reported that the Times had reported the event. There was no new reporting, merely a repeat of the same single story. But the perception is that every news outlet in the nation is reporting new information. Chizik asked a question of an NCAA official in a venue where he rightly expected privacy. The forum was not open to the media and the discussions were held behind closed doors. However the discussion unfolded, it doesn’t change on-the-record statements made by the NCAA president on numerous occasions. If you read the Times piece carefully, at no point does anyone say that Auburn is under investigation. It doesn’t indicate the specter of doom is looming over Auburn or any other program. It essentially tells us nothing we didn’t already know. Fierce online competition is also a battle for eyes. Online properties use page views and visitor rates to justify the lifeblood of advertising rates and to validate their own existence. The name Cam Newton draws readership. Readership validates advertising rates. Newton’s talent and personality was a brilliant beacon that drew curious moths by the thousands. Put the words ‘Cam Newton’ in a headline and be guaranteed viewership. It’s no surprise that the Auburn – Oregon BCS Championship game was the most watched program in the history of cable television. Even now, nearly eight months since his last game in an Auburn uniform, Newton remains one of the most talked about athletes in the country. The most significant factor that sparked the rush of media attention is the cult of celebrity that has overtaken America. We love the stars of stage and screen and field, but we like nothing better than watching them crash and burn. What gets more media mileage, Reese Witherspoon’s relatively stable life or the trainwreck that is Lindsay Lohan? Which is more compelling, the long and healthy marriage of Tom Hanks and Rita Wilson or the trailer park debauchery of Charlie Sheen? When Cam Newton exploded on the scene with his megawatt smile, his infectious enthusiasm and his boundless talent, he almost immediately transcended the football field. He became something larger, a cultural icon. Because the American public enjoys the tawdry more than the tame, Newton became a prime target of interest and open for attack. Forget the allegations. Forget the rumor. Many other players have been accused of worse, many have actually done worse and few ever felt the backlash Newton did. While Auburn upset the national applecart, Newton upset the entire balance of college football. The media was one year removed from deifying Tim Tebow as the greatest human to ever don a college jersey. Tebow was hailed as a once-in-a-generation player, the likes of which might never be seen again. Yet here was Newton. Bigger. Stronger. Faster. Better arm. Quicker feet. Better mechanics. Newton may not be the greatest athlete in college football history, but it’s hard to argue that he had one of the most productive and explosive seasons ever. He made Tebow — who is a fantastic athlete and deserving of tremendous respect — look pedestrian. Many in the media simply weren’t ready for that. So they found ways to criticize and tear Newton down. Was the backlash against Newton racially biased? Perhaps. One would hope that in this day and age Newton’s color would not reflect on his character, but disagreement might be voiced by Warren Moon, Randall Cunningham, Donovan McNabb and a host of others who have commented on their own situations in the past. Newton himself refuses to consider the possibility. When asked by an Andrew Corsello, a reporter for GQ Magazine, about the archaic concept that black quarterbacks are more natural athletes and white signal callers are students of the game, Newton was direct. Over time when nothing comes of the thousands of asinine rumors that floated for months, most of the jackals will move on. Other prey will draw their attention. We’ve already seen that as the ravenous horde flocks away from Auburn to feast on Oregon, North Carolina, Ohio State and others. They left without bothering to restore any of the damage they caused. They scurried away, leaving the truth untold. The reputations they unfairly impugned remain stained by their reckless reporting. The perceptions they created, many based on nothing but wisps of fog and rumor, persist. In the grand scheme of things, it won’t really matter to Auburn people. Auburn isn’t defined or limited by what others think. The Auburn family is the circle, those outside it are imposters. Chizik says that Auburn is a special place, like no other. He’s right. People outside the Auburn Family don’t really understand it or what drives the Auburn people. That lack of understanding can breed fear and fear spawns jealousy. Being a part of the Auburn Family, knowing that it’s more than a football team, more than buildings, more than brick and mortar, more than what a piece of sheepskin reads is one of those things is one of those spiritual things that cannot be explained to those who have never felt it. If you get it, if you understand and feel the Auburn spirit, you get it all the way. You’re all in. If you’re on the outside, if you’re not a part of the collective bond you don’t get it. You probably never will. Being a part of what Auburn is, you understand why Auburn students stand thousands strong during a two-hour rain delay. You comprehend why Tiger fans chant “It’s great to be an Auburn Tiger” — and truly mean it — even when the team loses. You know why two trees on a corner in the center of town own a special place in the hearts of Tiger fans. There are some who do not understand these things and devote their time and energy to tearing Auburn down. Tune them out. Nothing they say, nothing they do, nothing they believe can change Auburn. As members of the Auburn family it is imperative that others not be allowed to define us. We cannot worry about how we are viewed by those on the outside. Auburn fans know who we are. We know what we are. We know what we stand for and what we believe. No matter what anyone outside the family says or thinks, that’s enough. And that’s what those who oppose Auburn fear most. They can’t keep Auburn down. Bammers may not have invented the tactic, but they’ve certainly perfect altering reality through cultivation of false perception. The method used is repeating a lie long enough and loud enough so that it becomes TRUTH. It’s starts with “13 National Championship”. Though they’ve been caught red handed buying recruits, and Auburn never has, they constantly scream that Auburn buys players. They’ve been on probation for more than half the post Bryant era, and Auburn hasn’t been on probation since Dye left, yet they call us the dirtiest program. In the post Bryant era, they’ve been the leading D1 program in major sanctions, yet continuously publicly scream “Auburn’s dirty”. Fact is: LOSERS scream “They Cheated”. Bottom line. If the NCAA found a bag man….he’s someone paid by the REC to make that claim, and he better be ready to join Harvey Updyke in prison…. Cam Newton was of no interest to Coach Chizik, and he had to be talked into taking a serious look at the JUCO QB. No one knew how great Cam was going to be, so the idea that he was paid $180,000 to come to Auburn is ludicrous. The whole cash for playing deal was a scam by Kenny Rogers, and was an MSU issue. It is still a problem for MSU. Kenny Rogers is not now nor has he ever been affiliated with Auburn. Auburn was never involved in that situation, and did not pay Cam Newton $180,000 ever, at any time, so there is no “bag man” connected to Auburn University. There may be one connected to bammer though.